The new Hoyt Carbon Defiant feels and performs as if it were a 34-inch bow, which makes for a more optimally located peep sight and overall better shooting form and stable shooting. Hoyt has been making bows for 85 years, but if its 2016 lineup is any indication, Hoyt’s not looking back. The overall look is familiar, and to be sure a few features have been retained from last year, but all Hoyt’s carbon bows, and a few bows among its aluminum riser models, boast an array of new-for-2016 design elements. Also new is a rotating module cam system allowing for easy draw-length adjustments without replacing modules and without the need for a bow press. Dual cable stops are new as well, along with an optional limb stop for shooters who prefer a rock-solid back wall. The test bow was finished in Under Armour Ridge Reaper, a nice addition to the standard hunting finishes and wide array of custom and target finishes available on Hoyt’s bows. It contrasts nicely with the walnut grip and the understated Hoyt logos. Fit and finish were, as you might expect for a flagship bow, excellent. Hoyt’s characteristic bridged riser is something you have to work around when installing some rests, but this presented no problems on the test bow. Draw-length adjustments are easy enough with the new rotating module design. Limb bolts, when adjusting draw weight, turned smoothly and easily. Tuning and sighting-in went quickly, and without any hitches. Carbon bows are naturally on the light end of the spectrum. 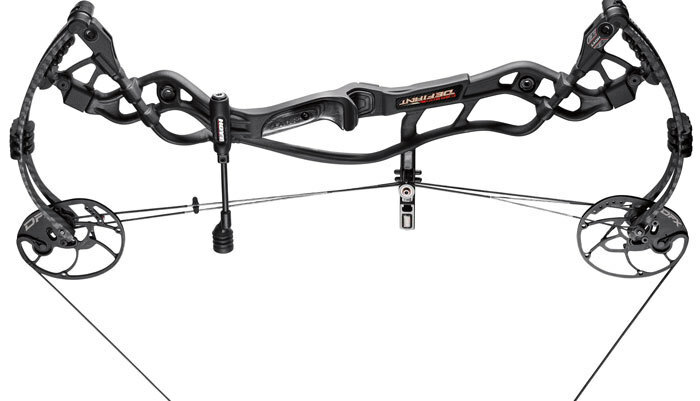 Heavier bows, like heavier rifles, have their advantages, but if you like a lightweight bow, the Carbon Defiant fits the bill. What I was most interested in testing on this bow was the new design that increases the length of the bow at full draw. In effect, the design does exactly that. (If you picture the limbs spreading as the bow is drawn to create a bow that is literally longer axle-to-axle than the same bow at rest, you’ve got it wrong; the new design might increase axle-to-axle length at full draw relative to other bows of the same axle-to-axle length at rest, but a more accurate image of how it works might involve picturing the cams rotating in such a way that the string comes off at a higher point on each cam.) A compact axle-to-axle length is an important quality to many bowhunters these days; the new Hoyt system offers a compact bow without the disadvantages usually associated with a compact bow, including string pinch, an awkwardly placed peep sight, less comfortable (and hence often less consistent) shooting form and a greater tendency to cant the bow – cant being not a big deal at 20 yards, a potentially very big deal at 40 yards. Hoyt’s carbon bows have always been known for a smooth draw cycle and lack of vibration at the shot. The Carbon Defiant is no exception, and it’s noticeably quieter than its predecessors. At 331 fps ATA, it’s got plenty of pop. And though I’ve never had an issue with the back wall of Hoyt’s bows, shooters who prefer the brick-wall feel of a limb stop are sure to favor this new option. Though it was referenced earlier, it’s worth pointing out again that the Carbon Defiant is available in a Turbo version for shooters wanting a little more speed and in a 34-inch version that offers the feel of a 37-inch target bow for those wishing to maximize accuracy and forgiveness. The non-carbon Defiants are available in similar configurations and offer surprisingly similar performance given the price. Overall, the entire new Defiant lineup offers some familiar and very popular Hoyt technologies with some truly innovative new design features that will please Hoyt loyalists and will undoubtedly win some converts to the brand.